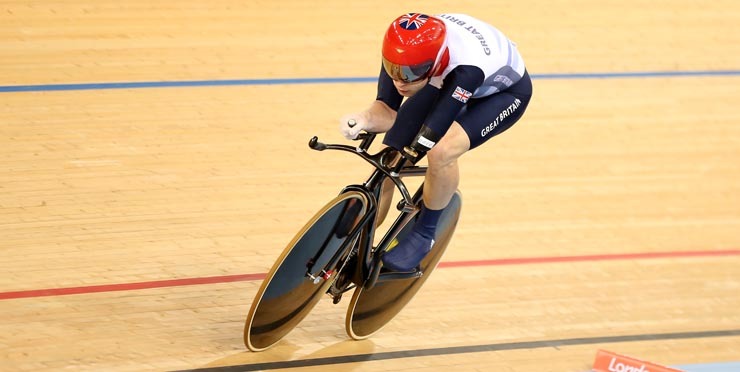 Paralympic cyclists are required to compete under the same conditions and rules as cyclists at the Olympic Games. In order to qualify for the para-cycling classification, a cyclist must be diagnosed with a health condition that causes permanent impairment, such as amputation, spinal cord injury, loss of sight, paralysis or cerebral palsy. While on the track, cyclists ride tandem or solo bicycles. The event kicks off with a one-kilometer time trial, in which competing athletes race against the clock to see who can reach the one-kilometer mark the fastest. In the first round, eight of the fastest pairs compete in a 200-meter time trial. The pairs progress to the knockout stages, in which pairs compete to win “best of three” over three laps. The Tandem Sprint is a tactical event, with riders competing for position before making that final sprint for the line. In this round, two teams of three riders complete three laps for the best time. Teams start at opposite ends of the track, with riders taking turns to complete one lap. The final rider will set the team’s time when crossing the finish line at the end of the final lap. In the fourth round, athletes compete individually. Competitors start at opposite ends of the track with the goal of catching their opponents. Athletes who catch and pass their opponents win the race. The four athletes who log the best times will progress to the next round. First- and second-place cyclists will compete for gold and silver, while third- and fourth-place competes for bronze. When cyclists from different classes compete against one another, the event will be factored. With factored events, each athlete’s level of impairment is taken into account. Some riders will have their times factored, while others will not. Several cycling events at the 2012 London Olympics were factored, including C1-2-3 kilo for men and women; and the C4-5 kilo for men and women. The gold medal will be awarded to the athlete with the fastest time after the times have been factored. Athletes who can’t ride a standard bicycle can compete in the cycling events, in which they ride a spinning bike on the track. Every effort is made to make the experience as realistic as possible using the best spinning bikes available. There are several classifications under the Bicycle class, including: C1, C2, C3, C4 and C5. The C1 classification includes the most severely impaired athletes, while the C5 classification includes athletes with impairments that have a minimum effect. Cyclists with visual impairments who are classified together will ride on tandem bicycles with a sighted pilot or guide rider. The level of visual impairment varies, from no light perception to a limited visual field or a visual acuity of 6/60. Classification is an ongoing process. Every athlete is observed regularly by classifiers to ensure fairness and consistency for all competing athletes.